As the name indicates the Barrier Reef Clownfish originates from Australia. 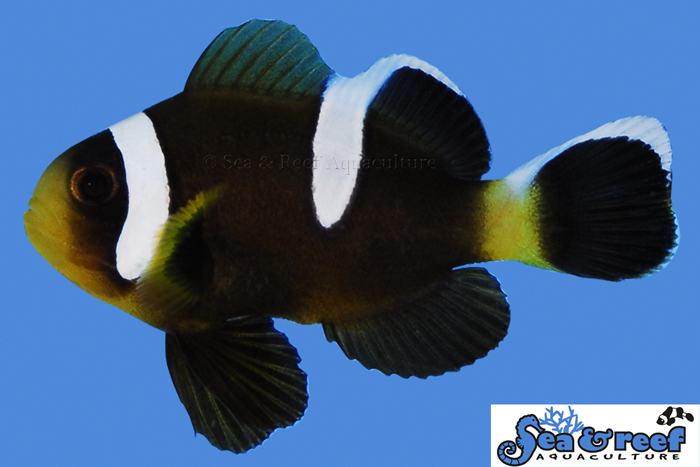 The Barrier Reef Clownfish is not very common in the aquarium trade and Sea & Reef Aquaculture has now made this species available as captive bred. Juvenile fish look very different than adults and buying a captive bred Barrier Reef Clownfish will give you the unique opportunity to observe first-hand the transition from the juvenile to the adult look. Juvenile fish are darker and exhibit different markings than the final adult coloration. The middle body bar in the juvenile fish extends up into the dorsal fin. As the fish matures the two white stripes develop an exquisite blue hue. The caudal fin of juveniles is black with a white horizontal bar on top that changes to white in the final adult stage. This is a large species that grows to about 5 inches. Despite its large size it is not particularly aggressive and fares very well in captivity. Australia’s Coral Sea. More specifically from Queensland and New South Wales to New Caledonia and the Loyalty Islands. The Barrier Reef Clownfish is one of the larger clownfish species. Despite its large size our experience with Barrier Reef Clownfish shows that they are not very aggressive. Since they can grow to 5 inches, we recommend keeping Barrier Reef Clownfish in tanks larger than 30 gallons. Captive bred clownfish do not need a sea anemone to survive in a reef tank. However, keeping clownfish with a sea anemone fosters a symbiotic relationship that is fascinating to observe. In the wild, the Barrier Reef Clownfish has been observed in several species of sea anemones including the Bubble Tip anemone (Entacmaea quadricolor), Beaded anemone(Heteractis aurora), Sebae anemone (Heteractis crispa), Magnificent Sea anemone (Heteractis magnifica), Haddon’s Carpet anemone (Stichodactyla haddoni) and Merten's Carpet anemone (Stichodactyla mertensii).